When did you begin working with fibers? AD: My mother taught me how to hand-spin wool when I was approximately ten years old. I grew up on a small family-operated farm with sheep and dairy cows, so this was part of the craft-focused environment of our home. 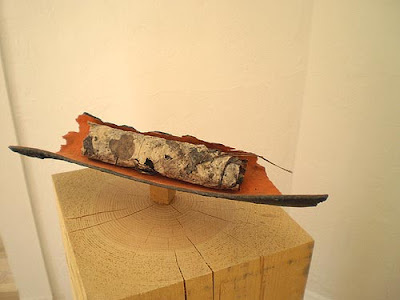 I did not incorporate fiber into my environmental and mixed media art work until approximately five years ago, or fifteen years after attending university and art school. What was your reason for choosing this media? AD: I choose to incorporate fiber into my studio and environmental work as I am particularly focused on sustainable process and methods. 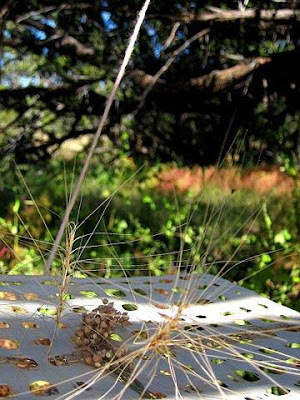 Sustainably produced fiber is ideal for site-specific art installations where one might, for example, 'draw on the land' with organic material or fiber in a temporary fashion. 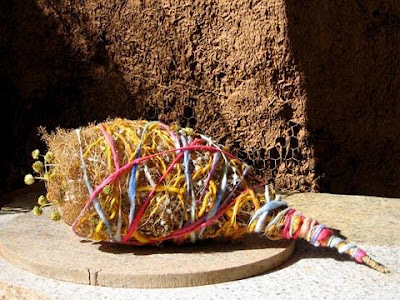 As a sculpture medium, fiber is also quite affordable, transportable, and evocative. How many times a week do you work with fibers? AD: Almost every day. 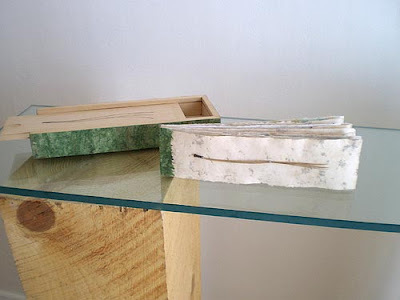 Even if I do not work with fiber per se, I often work with recycled paper, fabric, or household materials. What are your earliest memories of working with fiber? AD: Combing fleece or wool with my mother as a child, at eight or nine years of age. I also helped her to wind wool into skeins before she wound the yarn into a ball for knitting or weaving projects. Do you create work for yourself? Yes, for my own studio as well as site-specific installation projects that I am invited to do or that I initiate on my own. 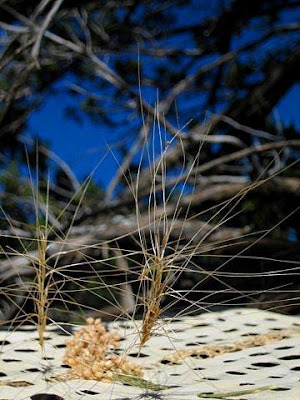 My sculptural fiber forms and prints or photos of environmental installations can be sold. The actual installations are not for sale. I have also sold works on paper and collage works in the past. Do you enjoy viewing fiber art in print or in person? 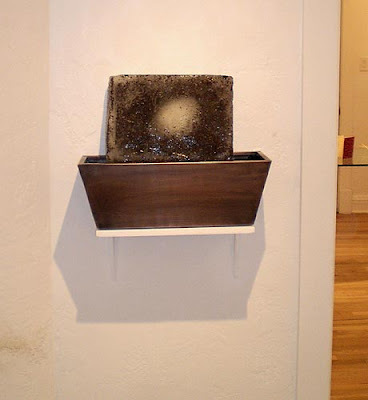 I prefer to view fiber art in person in order to get a sense of the texture and suggestive nature of the piece(s). 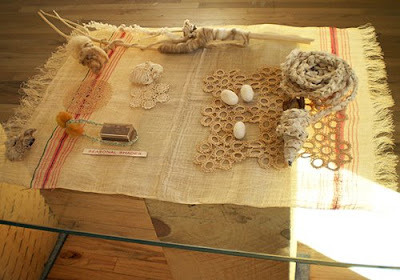 That said, I look at a lot of fiber art online, as this is the best way to learn about new uses for fiber, sustainable processes, as well as search for examples of other artists' work and methods. Describe a memorable experience with fiber arts? 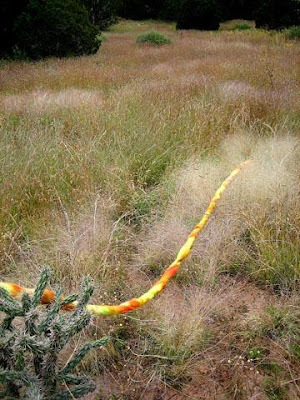 My most memorable (recent) experience working with fiber was my 2006 residency at THE LAND/an art site in New Mexico. You can read more here, as well as view several images. Does working with fiber arts affect your mood? Absolutely. I find working with fiber to be very grounding, centering, as well as revealing. 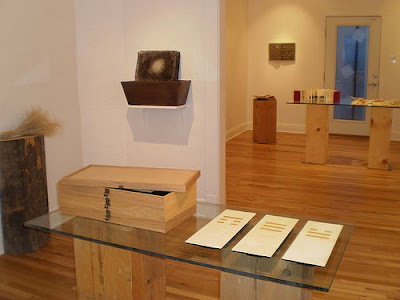 Regardless of studio or project locale, fiber as a material is inherently about recreating a source and finding innovative ways of telling a story about where specific fiber may have come from, what it can do in the present, and where this might lead you as an artist. I find that fiber is the one sculptural material that everyone can relate to, as it is so much a part of our every day life. This quality alone is comforting and familiar to people on some level. How do you feel while working with fiber? Grounded like a farmer. I know that fiber connects me to my childhood memories, my true identity, and my love for nature and natural processes. How do you feel about your finished fiber arts projects? I am typically quite amazed and amused by what a final project ends up being since fiber, as an organic and complex material, leads you in directions that you might not have originally anticipated. I am most intrigued by process, though, and I am always thinking about what fiber can do and how I can experiment even more for the next project or undertaking. How do you feel after a work of art is complete? Never fully content, just satisfied on some level that I might have learned something. I try to keep things open-ended about my definitions of "completion". I do not want to become formulaic about completing work or closing a loop. 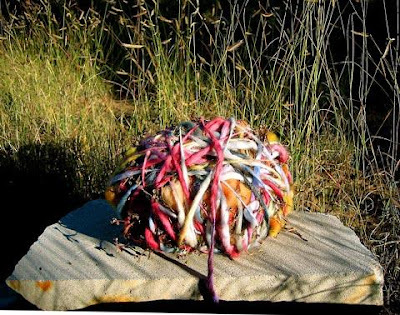 Are fiber arts therapeutic for you? I believe so. I do not think about my work as being consciously therapeutic, though. If yes, what makes them therapeutic? 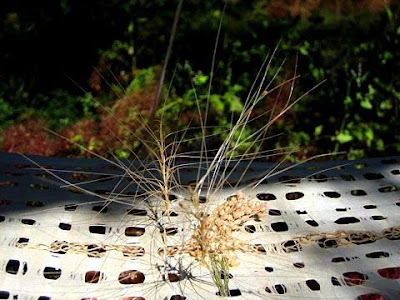 The dialogue and sensitivity to environmental issues; the attempt to demonstrate fragility and resiliency in nature; the time that it takes to make something in the same manner that nature might; the idea that fiber has a life of its own that one must acknowledge and weave into one's processes and art-making strategies. THE BOOK is, then, the container of provocation. Consider a book as a sequence (of texts, images, objects, ideas) bound or otherwise contained so that it’s kept together and in order. The binding or container also preserves its contents. The book for me should be without limits, like the desert, thus an exploded book… a desert form whose only limits are the four horizons. Consider the sequence of seasons, of growth and perpetuation, of metamorphosis, or any other natural sequence. What binds it together or contains it? What preserves it? What interrupts or disturbs it, and what are the consequences? 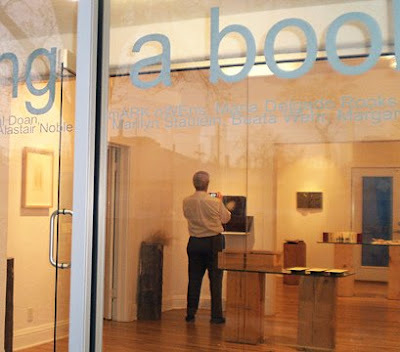 Books, like ecologies, are local systems. Like an ecosystem, any part removed from a book compromises the whole. 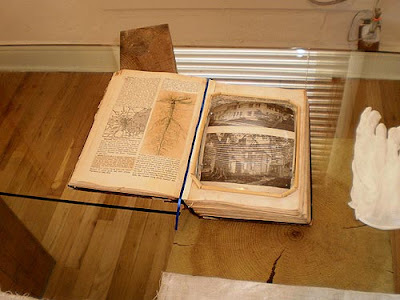 Unlike an ecosystem, anything put into a book can belong there. I know from my experience that books ultimately convey their own unspeakable language to the solitary reader.